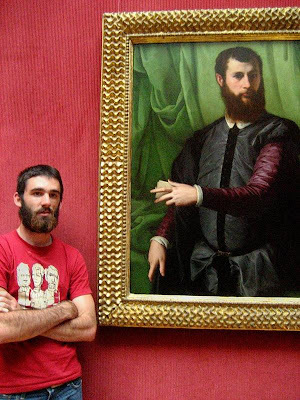 This is a portrait of a man with Portrait of a Man painted about 1544-1548 by Francesco Salviati. The man is BTUSA's Daniel Dobrick. The identity of man in the portrait in the portrait is a mystery but he is "almost certainly Florentine gentleman of high standing." Undoubtedly he is one of Daniel's ancestors and an early member of Beard Team USA. You can see the portrait in the portrait at the Getty Musuem (see http://www.getty.edu/art/gettyguide/artObjectDetails?artobj=906) but you can only see the portrait with the portrait here. distinctly creepy. great colors! I wish it was an eensy bit more formal though. Can you get him back there in a tie? That is an excellent pic. Very creepy...They are like twins. Quite helpful piece of writing, thanks so much for your post.